The remnants of Tughlaqabad states that it belongs to 13th century. Built by Ghiyas-ud-din Tughlaq, the founder of Tughlaq Dynasty. The nearby residential- commercial area and the road linking this site with Badarpur were named after this fort. Tughlaq, who was then called as Ghazi Malik once asked his Khilji Master to construct a Fort over a raised hillock. However, the master made joke of him and asked him to build it when he rule the dynasty. This provoked Ghazi Malik who defeated Khilji ruler and took over the dynasty. He changed his name into Ghiyas-ud-din Tughlaq and started building the fort. Since he had great love for the fort, he passed the rule that all people in his dynasty should work to build the fort. The mystic sufi in his dynasty got angry and cursed the king which not only stopped the progress of fort but also brought death to Tughlaq. The causeway which links the Tomb of Tughlaq with the Southern Part of Fort has 27 arches across artificial lake. 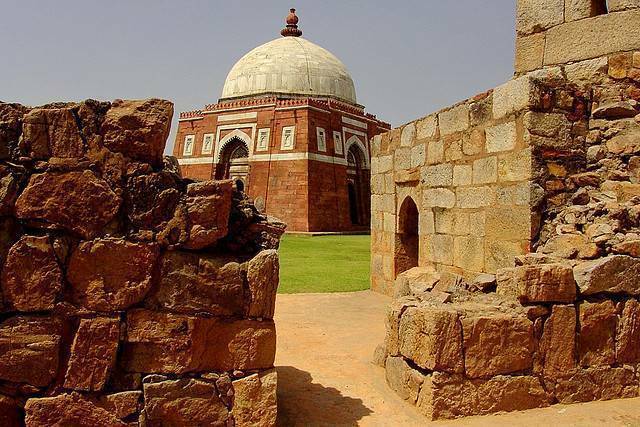 This red stone tomb houses the graves for Ghiyas-ud-din Tughlaq, his wife and his son Muhammed bin Tughlaq.